Writings on sewing related subjects, as well as whatever suits my fancy. First, thank you all who have commented on my dress!. I truly appreciate the feedback. I am not sure why photos are so blurry when I downloaded from camera to computer and then did some edits they look pretty clear. Somewhere along the way that got fuzzy. I think I mentioned in a previous post that this was fabric I acquired from Gorgeous Fabrics. It was so great to sew with. 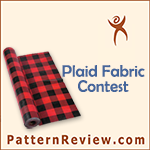 Quality fabric turns out a great garment, no matter the skill level of the sewist. Yesterday afternoon, early evening, I retraced the Hot Patterns Sunshine Top pattern. This morning after coffee and breakfast and reading emails and blogs, I cut out the pattern and sewed it. This was a "muslin" or "test" or "trial" garment. Well it is day two of my vacation. Today I had to go to dermatologist and upon return home, I put on makeup and then went to Quilt n Sew in Forest, VA. I met up with two friends from ASG, so we had lunch at the deli located in the shopping center. Then back to Roanoke, to the library and grocery store. Then home! So before starting on my next project I decided to put on my dress so everyone can see it looks much better on, than hanging on a hanger. Dress is 95% complete. It is all together now, fits great. I need to add hook and eye above the zipper. I need to topstitch the darts in the skirt portion to match up with topstitching of princess seams on the bodice. I may add shoulder pads or just use foam ones when wearing. I also want to stitch down the cross over portion on the bodice. It comes open a little and I prefer that it stay closed. This is the initial stage of my journey to sew the perfect empire waist dress. I am happy to report that I am actually over 80% complete at this time. These are photos I took on Saturday and Sunday. Yesterday I made major headway but alas it was a holiday and spending time with DH was called for. In between I did some sewing. This morning, the first day of my vacation, I started sewing around 6:30 or 7:oo and stopped at 11:15 to go to CURVES. I am back now, just had a chicken salad sandwich on rye bread and water. Decided to take the time to at least post this information as well as download several photos from the camera. Next on the agenda is a shower. Then back to the sewing room to finish my dress. I will post more along with photos of the dress. I had to do a lot of tweaking with this pattern, striving for perfection. Really I am striving for a good fit and this dress allowed me to hone some skills. Later! I am making headway on my dress. After completing the cutting out of the pattern, I set up my serger for edge finishing. I did all of the finishing last night. DH working late today, so upon arriving home from work, I began sewing my dress. The fabric is great to sew. I have sewn the front bodice pieces together and have pinned the back bodice pieces together. Time to take a break and fix a quick dinner as DH is finally making his way home. Something I have not shared with blog readers-I am on holiday and vacation!!!!!! Unfortunately (or fortunately depending on how one looks at it), DH is only off for the three day weekend. So most of next week will be PSD's. I have visions of completing numerous garments but usually the reality sets in and I don't get as much done as I think I will. But I am off to a good start. Tomorrow DH and I are taking a day trip to Richmond, VA. Great shopping is in store. No fabric store shopping however. Unless I just happen to see one. The pattern was laid out on the dress and all pieces fit! There is no extra for error. I've almost cut out all the pieces. 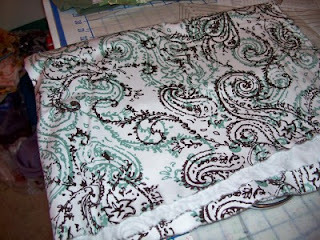 I am doing the Nancy Zieman 10-20-30 minutes to sew method. So a little each morning and hopefully a little tonight. I had to attend a board meeting for work last night so only time I had yesterday was before work. I pinned all the pieces onto the fabric. This morning I cut out the skirt pieces, the sleeves and one of the bodice pieces. Tonight I am cooking dinner; hate it when domesticity gets in the way of sewing. But hopefully after dinner I will finish the cutting and then get the serger threaded. I also need to check on the zipper and hopefully have one in stash. I tend to buy zippers frequently to have on hand. 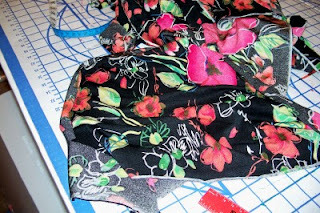 Here is a photo of my fabric that I am using for the upcoming empire waist dress from Vogue. I have not yet cut the pattern yet. It calls for 2.25 yds of 60" wide fabric. Guess what this is exactly that. I really think that I will be able to cut it out and still have some left for just in case! The fabric looks better "live" than in this photo. I washed it today so that it could shrink if it was going to. It is a stretch woven. 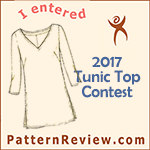 I also traced another top pattern-HotPatterns Sunshine Top. I am not sure if this is going to turn out well or not. I have some knit fabric that has been in my stash for awhile and will do a muslin using it. I have not had great success with HP patterns. I read reviews on PR about this top and those who reviewed it said they would make it again. All four reviewers gave it a thumbs up. Yet none of them spoke of any quirky adjustments they needed to make. I am beginning to work on another dress pattern. This is a Vogue pattern with an empire waist that is sleeveless or with short sleeves with cuffs. I will make it with the sleeves. I am going to use fabric I purchased from Gorgeous Fabrics that is a stretch woven in a teal and brown paisley print on white background. I have begun the pin fitting process. I made my usual FSA, narrow upper back and a 7/8 inch FBA. I will pin fit the skirt part next and hope to get this cut out tomorrow. I may also work on fitting and cutting out a knit top pattern as well. I kinda like to have some projects cut out and can then spend time just sewing several projects. I also have another dress pattern that I want to pin fit and get ready to cut out. I have some fabric that I just recently purchased from JoAnn's on sale that I want to use for this one. Did I tell you that I love this dress? As Carolyn-Diary of a Sewing Fanatic-says, the real test of a garment is the wearability factor. Well I wore my new dress today and it was great. I received a lot of nice compliments. The dress was very comfortable. The midriff ruching really adds a lot to this dress. I even found that I improved my posture while wearing it simply because I felt so good in it. Here are some photos of me wearing the dress before going off to work. Excuse the mess behind me, this is our catch all junk room but has the best mirror in the house for taking self photos. This was to be a swirly dress photo. It is hard to make a skirt swirl and hold camera steady to take the shot. This Butterick pattern has lots of options. I also got these two Connie Crawford patterns. Jacket, pants and top--I purchased it for the pants. Several of our local ASG members have made her pants and were highly complimentary. Skirt and blouse-I was intrigued by the skirt. All of these were $1.99 each. While visiting the Stitchers Guild site earlier this week I learned that JoAnn's had Vogue patterns for $3.99, Butterick and McCall's were $1.99. There were several patterns that I had seen or read reviews for at PR thus I took advantage of the sale prices and visited both of our JoAnn stores this weekend. This Vogue blouse-I have some eyelet fabric I want to make up this blouse in but will not use the three tiered sleeve, just too much for me. This Vogue dress-I think I have something in my stash to use for this one. This SB top-I have a pale rose colored silk dupioni that I think will work well for the short sleeve version for the summer. This dress-Though I won't do the puffy sleeves, perhaps will make them straight or petal shaped. I have another piece of eyelet that I would like to use for this but not sure that I have enough. The dress is complete. I love this dress! ; I love the fabric I used to make it! It was just such a great knit to sew with. No picking, no snagging, no curled edges. The dress fits great! I will show you some photos of the dress laying on the cutting table. I just did not want to show off the fit of this great dress without being all "dolled" up to show it off. I promise to take pictures when I wear it to work next week. This is the dress laying on the cutting table. I wanted to show the ruching on the overlay at the midriff. This will hopefully give you an idea of how the dress would look on.This is closer look of the midriff.This is the side seam with the ruching..I am now ready to start something new and just can't decide what it will be. I will sleep on it tonight. I love Friday! It is the end of the work week and visions of weekend opportunities surface during the day. My DH and I met for dinner at a little family restaurant, nothing fancy by far, but decent food. I think all food is decent when I get waited on instead of having to cook it myself. When I got home, off with the work clothes and into some comfy clothes-shorts and t-shirt. I then spent some productive time in my sewing room working on my dress. I made final touches to sleeves, inserted neckband and sewed the skirt piece to the bodice and midriff pieces front and back. Today I will sew sideseams and hem and viola!!! a new dress. DH had to work late last night, so after CURVES, shower and dinner I spent some time in my sewing room working on the Simplicity dress. I basted the side seams together for the bodice to try on before inserting the sleeves. I purchased this fabric last summer at the National ASG Conference in Washington, DC. I purchased it from SewKeysee. This is a small family business out of Florida. They have a few patterns for knit fabrics only. They had some great knit fabrics for sale. This is a beefy slinky knit. It was so easy to cut and it sews great. I am using a Stretch Needle and regular polyester thread. I have sewn a lot of slinky knits over the years. They are not all equal. I have had some that were extremely thin and when you sewed them up the weight of the knit pulled down and fabric became thinner. It was horrible to sew with as well. Other slinky jknits knits I have purchased were like this one in that it had some body to it, cut great and sewed up perfectly. This is the first patterned slinky that I have ever purchased, all others were solid colors. The background is black and has beautiful fuschia, coral, yellow and green colors. I really made some headway with my sewing today. 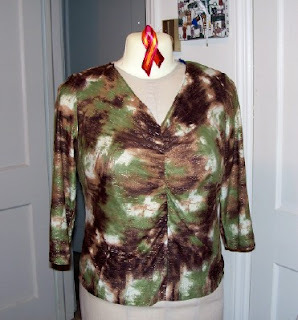 As I just posted I completed the Kwik Sew top. I started on the Simplicity dress. 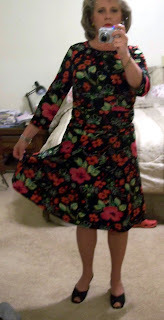 I read two reviews at Pattern Review for this dress pattern and both reviewers gave positive feedback. I read the instructions and decided to not follow them. My way will allow me to adjust the fit with the side seams. Their method has you sew the bodice front and back shoulders and side seams. 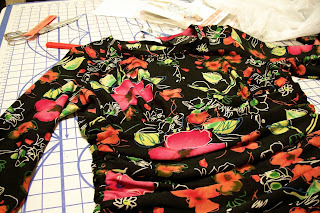 Then attach neckband and insert sleeves in the round. You then attach the overlay to the midriff piece-front and back, then sew side seams of the midriff/overly and attach to the bodice. You then sew side seams of the skirt and attach to midriff. Thus if you need to fit any thing you will have to undo a lot to do the fitting. For such a simple top, it took me way too much time to complete it. I just could not get in my sewing room to work on it as I wanted. I finished it this morning and I am happy to say I did start sewing on the Simplicity dress. Below are a few photos of my completed top. The fabric is from Gorgeous Fabrics. Ann calls this fabric-Monet Knit. I thought when I received my fabric it was going to be a bear to sew with. NOT AT ALL. It really did well. This is somewhat like a lightweight buttermilk knit, maybe like single span. The KS pattern calls for long sleeves or sleeveless. I wanted 3/4 sleeves so adjusted the long sleeve pattern to fit. I used a medium through the shoulders, neck and upper chest area, tapering to large from bust down. I ended up taking an additional 1/4 inch seam through the armscye for a better fit. I added a CB seam to allow for upper back as well as swayback adjustment. I like a CB seam as it allows for taking a deeper seam in the back if necessary. I have almost completed the KS top. This should be an hour sewing project once you have cut out the top. That is if you have uninterupted time. The top is finished except for the hemming. After sewing sleeves in and then sewing side seams, I decided I needed to take an additional 1/4 inch in the sleeves to bring shoulder in some and just a general overall fitting adjustment for the upper chest and shoulders. I am pleased with the outcome. This top looks good in this fabric and I am pleased with the overall look/style of this top. I will make some additional tops, well at least one more. Hope to post the completion soon! Cancer: Finally some good news! 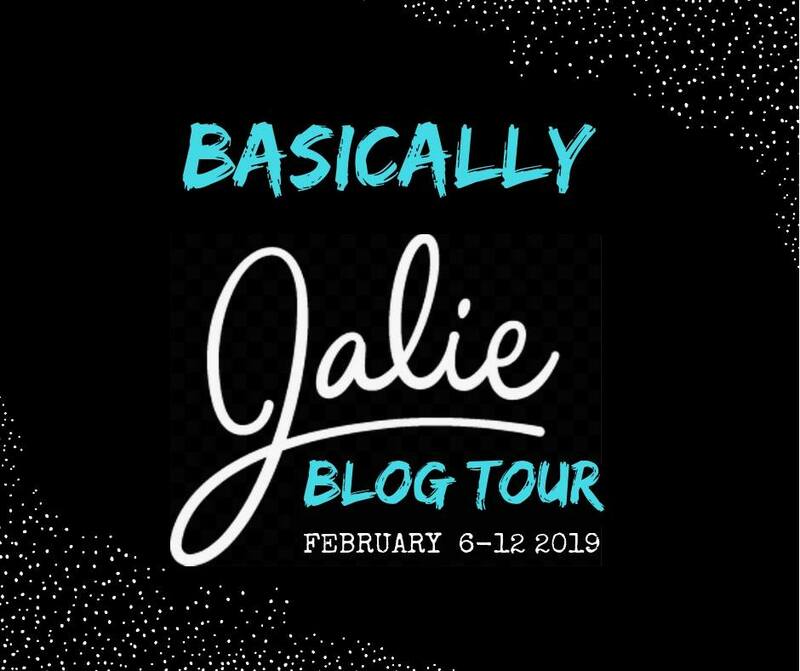 All contents of this blog are copyrighted 2006, 2007, 2008, 2009, 2010, 2011, 2012,2013, 2014, 2015, 2016, 2017 by DanvilleGirl. All rights reserved.